The Teachers’ Side of the SNCT met on the 18 September and all organisations present rejected the offer which had been made previously by the employers (COSLA). The Teachers’ Side regarded the offer as being “derisory” in terms of the 3% offer across the board and “divisive” in relation to proposing changes to the main-grade scale whilst leaving promoted scales untouched. This meeting was followed by a meeting of the SNCT Extended Joint Chairs (EIS, SSTA, COSLA and Scottish Government) where the Teachers’ Side formally rejected the employer’s pay offer. The offer was for 3% across all SNCT posts except for those earning £80,000 or above, whose increase would be limited to £1,600. 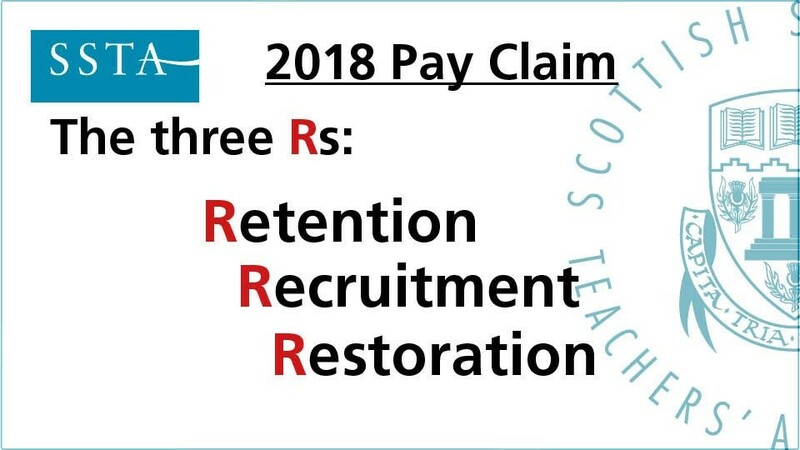 In addition to the 3% pay increase COSLA also supported a Scottish Government proposal to amend the Main Grade Salary Scale by reducing the number of points from 6 to 5 with a higher starting and finishing point. It was made clear that the 3% offer doesn’t come close to matching the ambition of the SNCT 10% claim for all members at all grades. During the discussions reference was made to the OECD report ‘ Education at a Glance’ that indicated the average teachers’ salary was equivalent to £42,000 and that Scotland was one of only 5 countries where teachers’ pay has fallen, relative to graduate earnings, over the past decade. The Teachers’ side were clear, also, that changes to only the main grade scale would be divisive. This is effectively a differentiated offer pay and this was not acceptable. The Teachers’ Side is willing to consider improvements to scale points but these would need to be financially equitable across all the scales. Both Scottish Government and COSLA were asked to consider the Teachers’ Side response and to return to the next meeting. The SSTA will continue to negotiate in good faith, with both COSLA and Scottish Government, with the next negotiating meeting of the Extended Joint Chairs to take place on the 4 October. Members will be kept informed of any progress made at that meeting. When the final pay offer is made SSTA will consult the membership on its views and the possibility of a formal ballot for industrial action. It is therefore, essential that member’s details are updated and accurate. Members can update their details by completing a form on the SSTA website at www.ssta.org.uk/updatedetails .